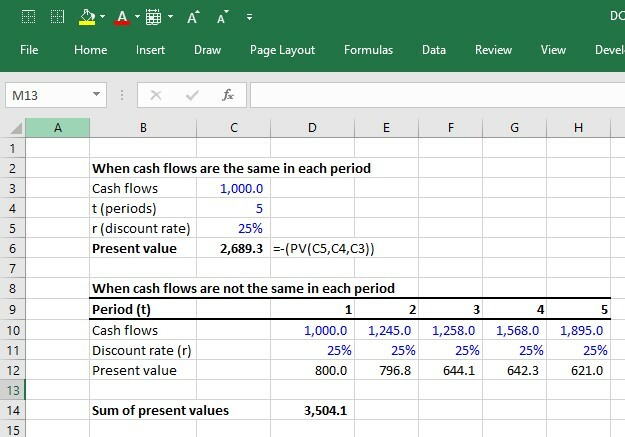 A discounted cash flow model ("DCF model") is a type of financial model that values a company by forecasting its' cash flows and discounting the cash flows to arrive at a current, present value. The DCF has the distinction of being both widely used in academia and in practice. Valuing companies using the DCF is considered a core skill for investment bankers, private equity, equity research and "buy side" investors. The DCF model estimates a company’s intrinsic value (value based on a company's ability to generate cash flows) and is often presented in comparison to the company's market value. For example, Apple has a market capitalization of approximately $909 billion. Is that market price justified based on the company's fundamentals and expected future performance (i.e. its intrinsic value)? That is exactly what the DCF seeks to answer. In contrast with market-based valuation like a comparable company analysis, the idea behind the DCF model is that the value of a company is not a function of arbitrary supply and demand for that company's stock. Instead, the value of a company is a function of a company's ability to generate cash flow in the future for its shareholders. We wrote this guide for those thinking about a career in finance and those in the early stages of preparing for job interviews. This guide is quite detailed but it stops short of all corner cases and nuances of a fully fledged DCF model. For that, you can enroll in our full scale modeling course. The premise of the DCF model is that the value of a business is purely a function of its future cash flows. Thus, the first challenge in building a DCF model is to define and calculate the cash flows that a business generates. There are two common approaches to calculating the cash flows that a business generates. Forecast and discount the operating cash flows. Then, when you have a present value, just add any non-operating assets such as cash and subtract any financing related liabilities such as debt. Forecast and discount the cash flows that remain available to equity shareholders after cash flows to all non-equity claims (i.e. debt) have been removed. Step 1 is to forecast the cash flows a company generates from its core operations after accounting for all operating expenses and investments. These cash flows are called "unlevered free cash flows." You can't keep forecasting cash flows forever. At some point, you must make some high level assumptions about cash flows beyond the final explicit forecast year by estimating a lump-sum value of the business past its explicit forecast period. That lump sum is called the "terminal value." The discount rate that reflects the riskiness of the unlevered free cash flows is called the weighted average cost of capital. Because unlevered free cash flows represent all operating cash flows, these cash flows “belong” to both the company’s lenders and owners. As such, the risks of both providers of capital need to be accounted for using appropriate capital structure weights (hence the term “weighted average” cost of capital). Once discounted, the present value of all unlevered free cash flows is called the enterprise value. If a company has any non-operating assets such as cash or has some investments just sitting on the balance sheet, we must add them to the present value of unlevered free cash flows. For example, if we calculate that the present value of Apple’s unlevered free cash flows is $700 billion, but then we discover that Apple also has $250 billion in cash just sitting around, we should add this cash. The ultimate goal of the DCF is to get at what belongs to the equity owners (equity value). Therefore if a company has any lenders (or any other non-equity claims against the business), we need to subtract this from the present value. What’s left over belongs to the equity owners. Often, the non-operating assets and debt claims are added together as one term called net debt (debt and other non-equity claims – non-operating assets). You’ll often see the equation: enterprise value – net debt = equity value. The equity value that the DCF spits out can now be compared to the market capitalization (that’s the market’s perception of the equity value). The equity value tells us what the total value to owners is. But what is the value of each share? In order to calculate this, we divide the equity value by the company’s diluted shares outstanding. Now let’s break down each step into more detail. EBIT = Earnings before interest and taxes. This represents a company’s GAAP-based operating profit. Tax rate = The tax rate the company is expected to face. When forecasting taxes, we usually use a company’s historical effective tax rate. D&A = depreciation and amortization. NWC = Annual changes in net working capital. Increases in NWC are cash outflows while decreases are cash inflows. Capital expenditures represent cash investments the company must make in order to sustain the forecast growth of the business. If you don’t factor in the cost of required reinvestment into the business, you will overstate the value of the company by giving it credit for EBIT growth without accounting for the investments required to achieve it. 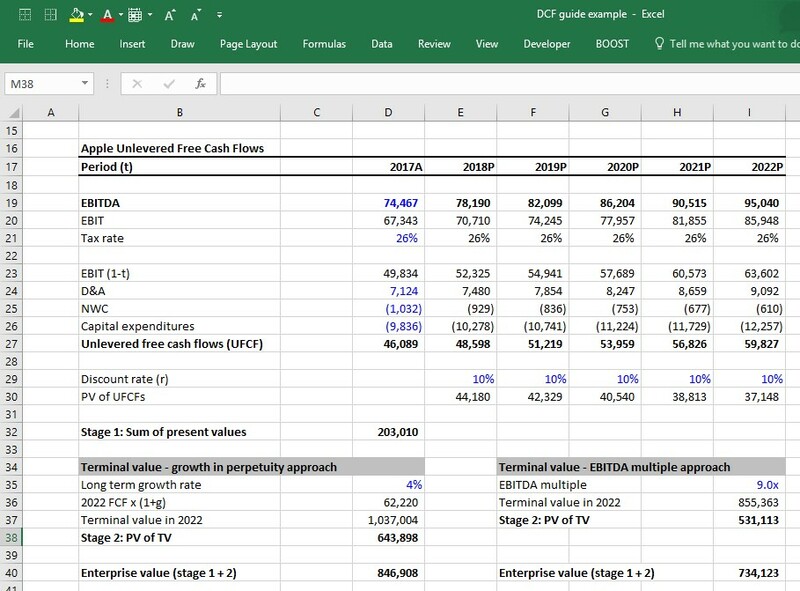 Forecasting all these line items should ideally come from a 3-statement model because all of the components of unlevered free cash flows are interrelated; Changes in EBIT assumptions impact capex, NWC and D&A. Without a 3-statement model that dynamically links all these together, it is difficult to ensure that changes in assumptions of one component correctly impact other components. 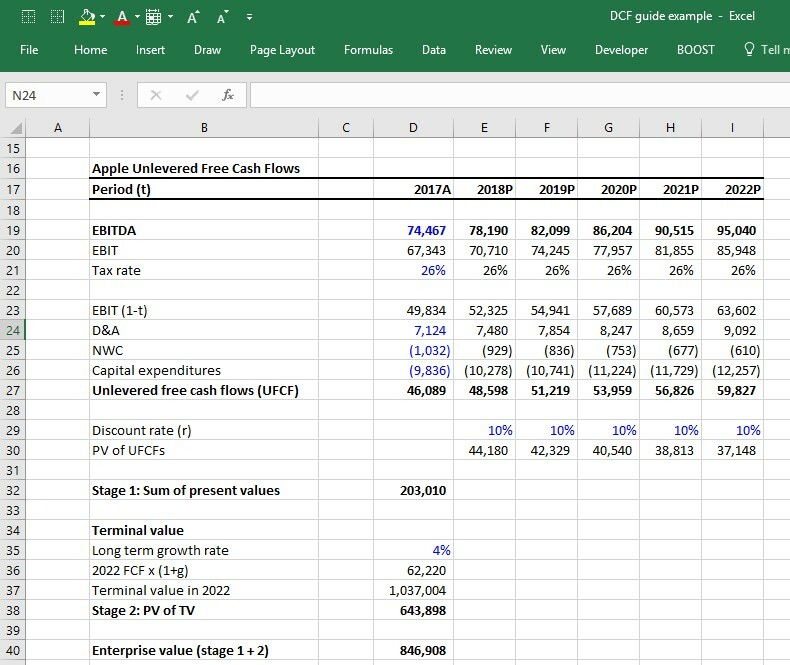 Because this takes more work and more time, finance professionals often do preliminary analyses using a quick, back-of-the-envelope DCF model and only build a full DCF model driven by a 3-statement model when the stakes are high, such as when an investment banking deal goes “live” or when a private equity firm is in the later stages of the investment process. The 3-statement models that support a DCF are usually annual models that forecast about 5-10 years into the future. However, when valuing businesses we usually assume they are a going concern. In other words, they will continue to operate forever. That means that the 3-statement model only takes us so far. 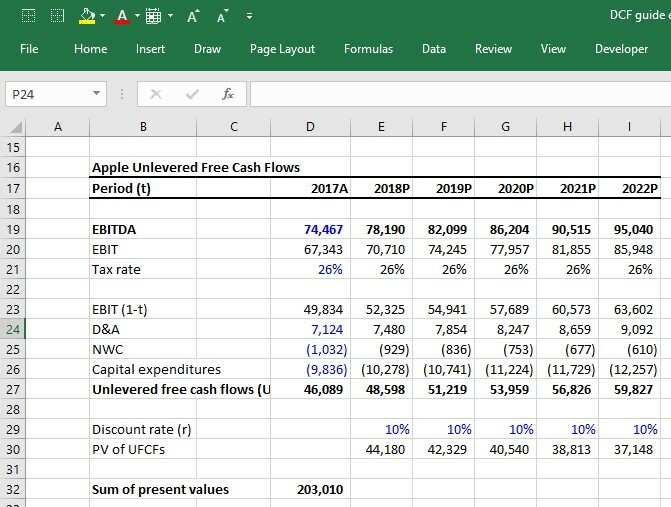 We also have to forecast the present value of all future unlevered free cash flows after the explicit forecast period. This is called the 2-stage DCF model. The first stage is to forecast the unlevered free cash flows explicitly (and ideally from a 3-statement model). The second stage is the total of all cash flows after stage 1. This typically entails making some assumptions about the company reaching mature growth. The present value of the stage 2 cash flows is called the terminal value. At this point, notice that we have finally calculated enterprise value as simply the sum of the stage 1 present value of UFCFs + the present value of stage 2 terminal value. The growth in perpetuity approach forces us to take a guess as to the long-term growth rate of a company. The result of the analysis is very sensitive to this assumption. A way around having to guess a company’s long term growth rate is to guess the EBITDA multiple the company will be valued at the last year of the stage 1 forecast. A common way to do this is to look at the current EV/EBITDA multiple the company is trading at (or the average EV/EBITDA multiple of the company’s peer group) and assume the company will be valued at that same multiple in the future. For example, if Apple is currently valued at 9.0x its last twelve months (LTM) EBITDA, assume that in 2022 it will be valued at 9.0x its 2022 EBITDA. Investment bankers and private equity professionals tend to be more comfortable with the EBITDA multiple approach because it infuses market reality into the DCF. A private equity professional building a DCF will likely try to figure out what he/she can sell the company for 5 years down the road, so this arguably provides a valuation that factors the EBITDA multiple in. However, this approach suffers from a significant conceptual problem: It uses current market valuations in the DCF, which arguably defeats the whole purpose of the DCF. 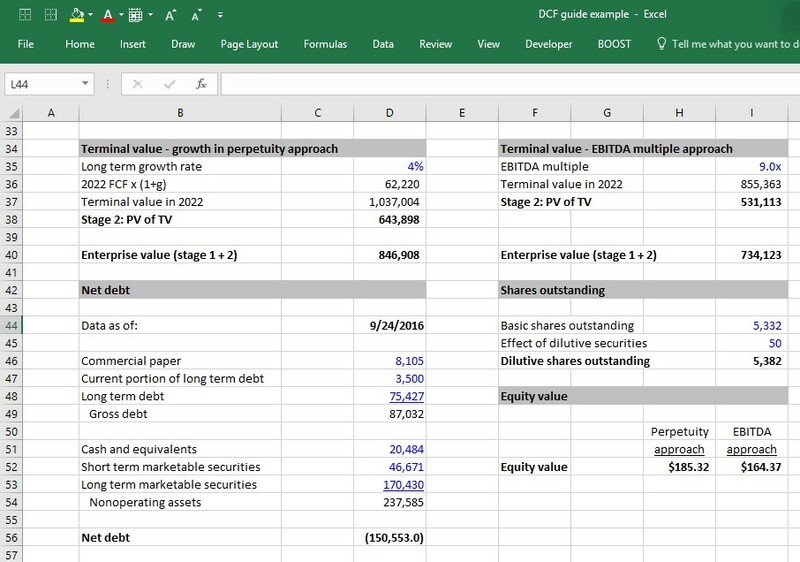 Making matters worse is the fact that the terminal value often represents a significant pecentage of the value contribution in a DCF, so the assumptions that go into calculating the terminal value are all the more important. 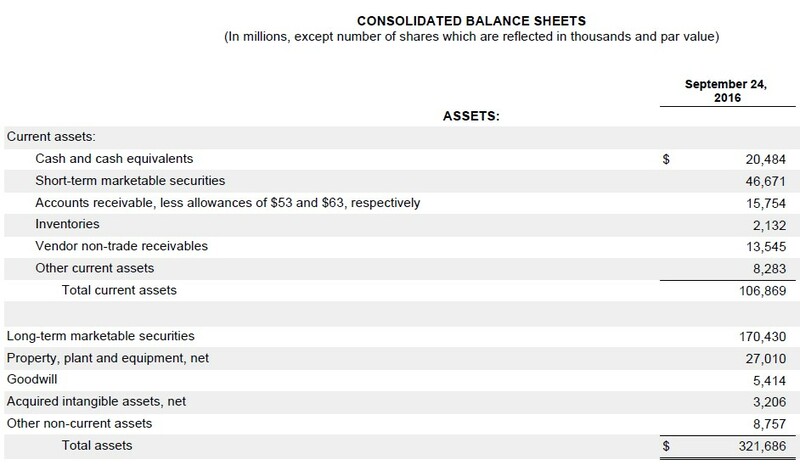 Below is Apple 2016 year ending balance sheet. The non-operating assets are its cash and equivalents, short-term marketable securities and long-term marketable securities. As you can see, they represent a significant portion of the company’s balance sheet. Unlike operating assets such as PP&E, inventory and intangible assets, the carrying value of non-operating assets on the balance sheet is usually fairly close to their actual value. That’s because they are mostly comprised of cash and liquid investments that companies generally can mark up to fair value. That’s not always the case (equity investment is a notable exception), but it’s typically safe to simply use the latest balance sheet values of non-operating assets as the actual market values. Below is Apple’s 2016 year ending balance sheet liabilities. You can see it has commercial paper, current portion of long term debt and long term debt. 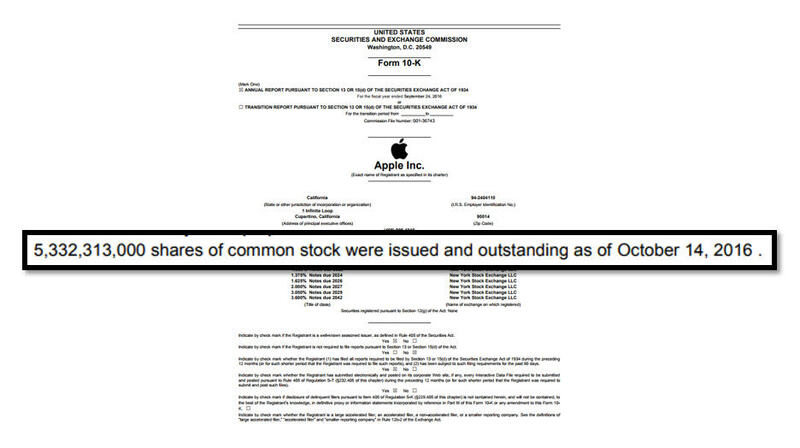 These are the three items that would make up Apple’s non-equity claims. As with the non-operating assets, finance professionals usually just use the latest balance sheet values of these items as a proxy for the actual values. This is usually a safe approach when the market values are fairly close to the balance sheet value.vThe market value of debt doesn’t usually deviate too much from the book value unless market interest rates have changed dramatically since the issue, or if the company’s credit profile has changed dramatically (i.e. a company in financial distress will have its debt trading at pennies on the dollar). One place where the book value-as-proxy-for-market-value can be dangerous is "non-controlling interests." Non-controlling interests are usually understated on the balance sheet. If they are significant, it is preferable to apply an industry multiple to better reflect their true value. The bad news is that we rarely have enough insight into the nature of the non-controlling interests’ operations to figure out the right multiple to use. The good news is that non-controlling interests are rarely large enough to make a significant difference in valuation (most companies don’t have any). 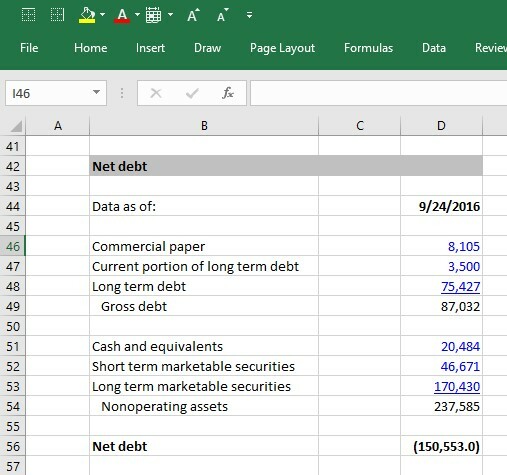 Using Apple’s 2016 10K, we can see that it has a substantial negative net debt balance. For companies that carry significant debt, a positive net debt balance is more common, while a negative net debt balance is common for companies that keep a lot of cash. 2. Next, add the effect of dilutive shares. These are shares that aren’t quite common stock yet, but that can become common stock and thus be potentially dilutive to the common shareholders (i.e. stock options, warrants, restricted stock and convertible debt and convertible preferred stock). Each of these assumptions is critical to getting an accurate model. In fact, the DCF model's sensitivity to these assumptions, and the lack of confidence finance professionals have in these assumptions, (especially the WACC and terminal value) is frequently cited as the main weaknesses of the DCF model. Nonetheless, the DCF model is one of the most common models used by investment bankers and other finance professionals, and the DCF output is almost always presented using a range of terminal value and WACC assumptions, as well as in context to other valuation methodologies. A common way this is presented is using a football field valuation matrix. I hope you enjoyed this guide, which is a simplified version of our leading financial modeling training program. Our full program is used by the largest investment banks in the world to train new hires and by top business schools to prepare their students for careers in finance. 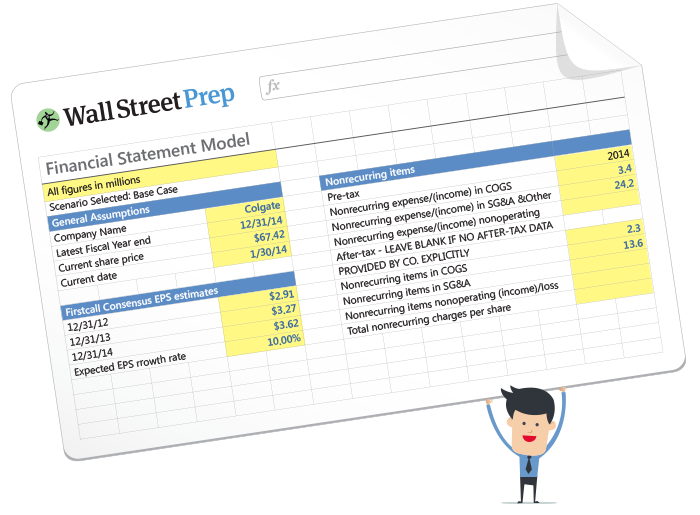 Enroll in the Wall Street Prep Premium Package at 15% off by using promo code webpromo at checkout.